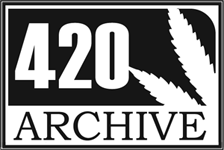 Your generosity will help to share and ensure the preservation of the history of marijuana prohibition, including the little known people, events and organizations that played a vital role. Thanks to you, we can prevent historical documents and memories from being lost forever and preserve them for the benefit of future generations. We are a 501(c)3 nonprofit organization; your donation is tax deductible.